NSW Chapter GOTV Committees Under Way! What a great turnout we had at our most recent chapter meet-up on 20 February! It was excellent to see many new faces and have great engagement from everyone. We paired up to share our plans on how we're going to vote this year and we helped those who haven't yet requested their absentee ballots by going to votefromabroad.org. 1. 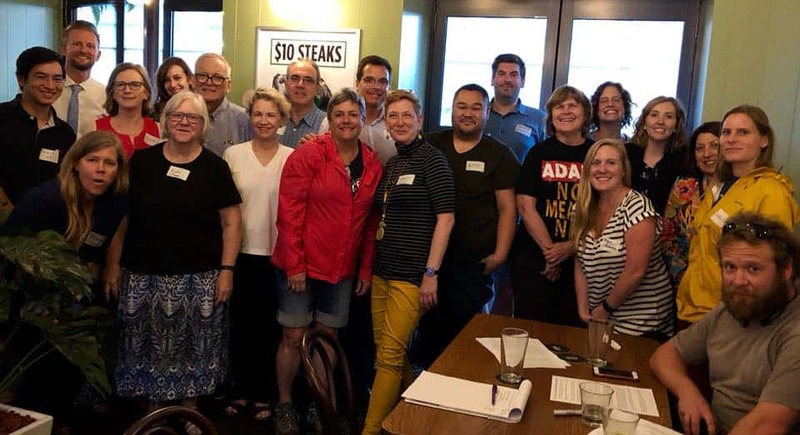 GOTV Events and Information Committee​—the purpose of this committee is to identify events with a potentially high density of Americans and send a group of volunteers to recruit new DA members, provide GOTV information and printed material. Examples of events could centre around the Fourth of July, Obama’s visit and Clinton’s visit. 2. GOTV Marketing and Media/ Social Media Committee—the purpose of this committee is to produce a coordinated marketing strategy for our GOTV campaign activities including, but not limited to slogans, graphics, print material, social media ads and press releases. 3. GOTV Calling Campaign Committee​—the purpose of this committee is to organise volunteers to take part in a calling campaign in the months leading up to the mid-term elections around September and October using the DA-funded phone banking service through Call Hub. For more information or if you’d like to volunteer to be a part of any of these committees, please email our NSW Chapter State Secretary Rebecca Turnbow at rebturnbow@gmail.com. Mark your calendars for our next Chapter Meet-Up at 6:30pm, on Tuesday, 20 March at the Aurora Hotel in Sydney. I’d like to share a recent communication from Shaun Barnes who is the Regional Vice Chair, Asia Pacific - Hong Kong, Democrats Abroad. "I've recently seen several social media posts on AP Facebook pages with links to a petition for the new Territorial Taxation for Individuals (TTFI) proposal being pushed by Republicans Overseas. Carmelan Polce and the Taxation Task Force have circulated several messages on this, but I wanted to make it absolutely clear for all our CC leaders that TTFI is not the same as the Residency Based Taxation (RBT) plan advocated by DA and does not promote Democratic principles. You may have seen a table produced by RO that compares TTFI to RBT. The key difference that emerges is that under TTFI the offshore earnings of Americans living in the US will not be taxable. RO's plan would provide a windfall to the wealthiest of US-based Americans who are the most likely to be generating income abroad (or who can afford complex tax-structuring to make it appear that they are earning income abroad). This does not help ordinary, middle class Americans. But it is a tax loophole just waiting to be exploited. Of course, TTFI also benefits Americans abroad like our members who generate all or most of their income in their countries of residency - but this tax reform, which is so important to our financial lives, shouldn't be held hostage to the tax ambitions of the top 1% of US income earners. Our support for any package of tax reforms will depend on how it aligns with our Democratic Party values. We will support common sense reforms that clarify and simplify filing and make the tax code fairer for all Americans. The provisions of the tax package must help reduce inequality, boost opportunity and raise revenue predominantly from those with the greatest ability to pay. The advantages of changing from Citizenship Based Taxation to RBT must primarily benefit ordinary Americans living and working abroad. The policy must include straightforward criteria for Americans abroad to use in establishing eligibility and should not obstruct freedom of movement. RBT should be revenue-neutral to the federal government and not significantly add to the federal deficit. RBT must not open tax avoidance loopholes or otherwise include avenues for high net worth taxpayers to abuse for the purposes of tax avoidance. We will not support reforms that restructure the federal government by starving programs that are important to national, community or individual well-being. TTFI obviously fails more than one of these criteria. Please share these resources and survey results with your members, both to engage them in the campaign for RBT and so they understand the effort that DA's tax team is making on their behalf to advocate for tax reform. Both hailing from Chicago, Marla Minow and Steve Knuth have been unanimously elected to lead the NSW Chapter of DA Australia as Chair and Vice-Chair respectively. Marla brings several years of experience to DA having served in leadership roles previously. She believes that Democrats have become complacent, "I recognise that when the Democratic Party was in power I was very inactive and that now that we have lost the White House, both houses of congress and governorships across the country that I want and need to be in action and a force for change." Balancing out the leadership team, Steve decided to run because he wanted to get more involved in reaching out to like-minded people who can work together to strengthen DAA NSW and attract more members. "If you've never been involved, there's never a good time like now to start."